New Year. New Art at Facet Gallery. Excited to be part of this show! January 12th!!. We are bringing back some of our absolute favorite artists for our first show of 2019! We sincerely hope you’ll join us for this free event. I love getting the opportunity to show my work at amazing places throughout Atlanta. Art is a visual language. Its aim: to communicate. BEYONDWORDS explores how artists combine images and words to produce thoughts and feelings not generated by either alone. There is a space between the two that offers possibilities and inspiration to the artist where words are a catalyst for visual expression. Just finished a mural for Street Smart Youth Project through my residency with The Creatives Project (TCP). GREAT SHOW TO START YOUR ART COLLECTION. Was part of a great show at FACET Gallery in Atlanta, GA. Details and some photos from the event off of their page. You can still see the show! I need space. I need to evolve. I need to get rid of this artwork. Take a look at the gallery below, or download the pdf and see what John Tindel has available. He has been known to burn paintings to make room for new ones. Just sayin'. If you are seriously interested in any or all the pieces, contact us and we will get you a price list. NEW TINDEL ARTWORK ON EXHIBITION. This painting was created over a three day period. Each day I worked about 4-6 hours on it. Using only Paynes Grey (and a little off white) I created a simple image , a comfortable image. Check out photos below and share them with other folks that might like this kind of stuff. HUGE Inc justed moved to Atlanta and asked The Creative Life to create something a little bit southern on a 3D text form of their logo. Yes we did! Worked with the Mayor's Office of Cultural Affairs and the City of Atlanta to create a unique bike rack to encourage more bicycle transportation. I think that I finished it! See below for a quick preview of complete Atlanta Bike Rack Project for The Mayor's Office of Cultural Affairs. South Opening reception July 9, 6-10pm The 3rd annual group show where over 50 artists express thoughts and feelings about the contemporary South and all its complexities. This will be a fun, large group show with a wide array of things to see. Great time and the Goat Farm Open Studio this weekend. Got to hang with my little man and meet a bunch of great folk. Looking forward to opening up the studio more often. New works in progress and looking forward to sharing them. Want to come visit, set up an appointment by emailing me here. It was about surviving the heat. Living installation showcasing ultra-creativity and refreshing, cold, wonderful, and at times, life saving beverage they call Heineken. The Creative Life CEO was chosen to participate in the Living Walls: The City Speaks Conference as one of their mural artist. I will be painting LIVE this Saturday for the One Love Generation + Sam Flax + Goat Farm auction to benefit One Love. I should be there around 1 and paint till it closes. Come say hello and see if what I will make (cause I have no clue)! This is the piece I auctioned off last year. My version of Batman. Check out the details and other badass artists that are participating. Sam Flax + Goat Farm Arts Center presents 30 Artists in 30 Days: an event to benefit One Love Generation April 5th at The Goat Farm Arts Center's Rodriguez Room. 30 Artists each created a work of art on a scheduled day during the month of March, live in the Sam Flax Art & Design store. All artwork created by the participating artists will available to bid on throughout the evening of April 5th, when a silent auction will be held in the Rodriguez Room. Bidding details to follow. E-merge is a survey of Atlanta's contemporary artists conceived and curated by Hope Cohn for the Art Program at Hartsfield-Jackson Atlanta International Airport. The exhibition is on view at the T-Concourse from January 2013 to January 2014 and features TindelMichi and other artists. Did it again this year at Art, Beats & Lyrics. Had to paint over my old design... that sucked a bit. Then, I started with a little too clean and modern design, but wasn't quite funky enough for this event. So I created letters that I handcut out of tape on wood. Spray painted the cuts, then took photos to vector. Once, the letters were vectored I enlarged them and cut them out on a vinyl plotter. The "BEEN DONE THAT" wall was created. 7 feet by 8 feet of pure vinyl freshness. Anyway, here are some photos that Michi Meko sent me from the event. Born and Bred is a group exhibition which is inspired by American People, Places and Things. 22 Artists join forces to display a new body of work centered around the American Culture. The exhibit opens Saturday, February 9th, 2013 at ABV Gallery. In Progress Photo Collection of the painting I will have in the exhibit. ILLUMINATE: [ɪˈluːmɪˌneɪt] to enlighten intellectually or spiritually; to become lighted; glow. 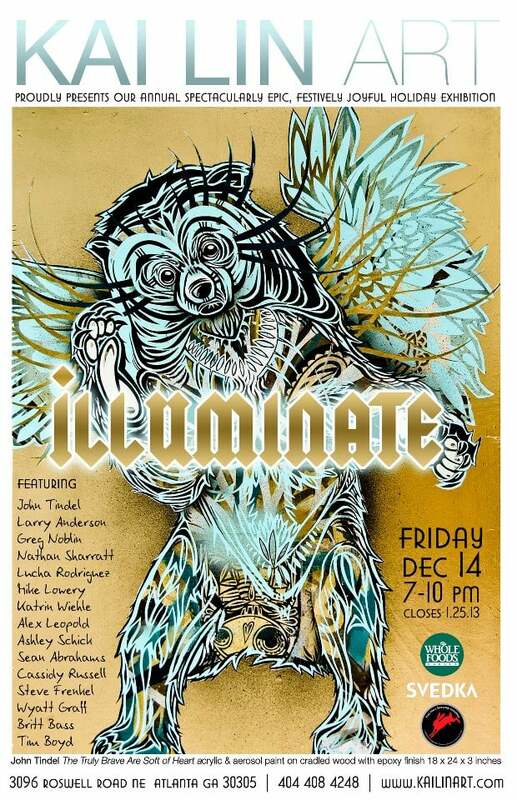 ILLUMINATE is a group exhibition featuring new art works by artists John Tindel, Larry Anderson, Greg Noblin, Nathan Sharratt, Lucha Rodriguez, Mike Lowery, Katrin Wiehle, Alex Leopold, Ashley Schick, Sean Abrahams, Cassidy Russell, Steve Frenkel, Wyatt Graff, Britt Bass and Tim Boyd. We’d like to thank our wonderful sponsors for making our opening a success: WHOLE FOODS BUCKHEAD for providing organically wholesome hor d’oeuvres, SVEDKA VODKA offering complimentary Svedka AFFINITINIs! Thank you also to BOMBAY SAPPHIRE for providing complimentary Gin-infused cocktails as well as RED HARE BREWERY for the festive beer! Buy local and help support our arts community!